It is always a joy to see an artist who is on a roll, who is in a creative zone where things are working well and ideas are flowing smoothly. And it is particularly cool to be a part of that artist's experience, to be able to share that joy with our listening audience and revel in the results of the artist's efforts. 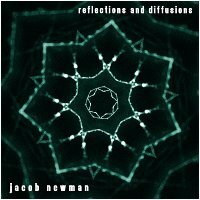 So it is with Jacob Newman, an artist who has been part of Earth Mantra for less than a year, but who has in that brief time been producing music of superb quality and ever-evolving beauty at a prolific rate. Only four short months ago, we released his evocative No Midpoint to Infinity, an excellent album in its own right. But when we heard his latest release, Reflections and Diffusions, we knew he was really onto something special. Where his previous efforts tended toward the textural and the atonal, in his current release Jacob has created works that are both effortless to listen to and deep enough to be satisfying for many many listens. The music on this album is simply beautiful. While Jacob does adorn his soundscapes with his trademark textural goodness, we would go so far as to say he is flirting with the realm of light ambience, the place where the sound is lush and bright and carries the listener away on a cloud. What is so enjoyable about Jacob Newman is that he somehow manages to keep one foot in each world, one in the area of abstract texture and the other in the area of tonality. His music is simultaneously soothing and challenging, a balance that is remarkably difficult to strike, but somehow Jacob makes it look easy. As usual, Jacob delights us with his ability to transform traditional instruments into otherworldly sound sculptures. In the case of Reflections and Diffusions, nearly everything we hear is processed bass guitar or acoustic piano, with the occasional appearance of the Microwave XT -- all transformed via granular resynthesis in custom algorithms of Jacob's own design, and mixed together with software synthesis of various sorts. The result is a transcendent melange of sound, ranging from sublime tone poems all the way to full blown ambient orchestrations. And the result is transformative, an album that is equally at home as the backdrop for work or study as it is satisfying for the active listener. Earth Mantra is very excited to be bringing Jacob's wonderous ambient music to our listening audience, and couldn't be happier to release his latest masterwork Reflections and Diffusions. Highly, highly recommended.